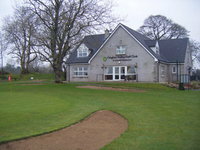 Located just outside the town of Fivemiletown on the border of Counties Fermanagh and Tyrone, Clogher Valley Golf Club is a challenging nine hole golf course. This fine parkland course is Par 67 and has a new restaurant and lounge on the premises. The course was established in 2000 and welcomes groups, societies and individual visitors. The large clubhouse offers a full range of services including two bars (upstairs and downstairs), fully licensed restaurant, television, a welcoming fireplace and also changing facilities. The golf course offers golfers of all skills with a highly enjoyable yet testing challenge. 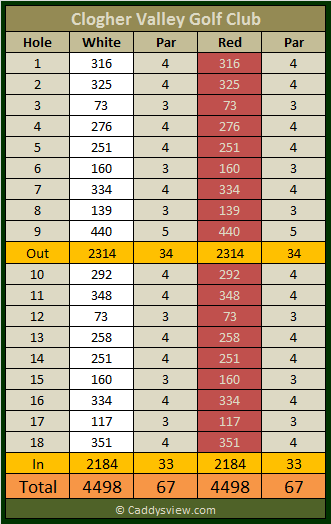 The course itself comprises of 6 Par3, 11 Par4 and 1 Par5. There are second tee boxes for the second nine at 6 holes and there are also three small lakes in play in 6 of the holes and a stream in play at 2 holes.